The unzipping sound of a tent flap in the darkness was the first sound of this early morning. I stumbled out into the cool, fresh eastern Montana air. Bumbling around with my flashlight, I managed to get a pot of coffee started on the old propane Coleman stove. Then went off to relieve myself. We were at Crow Agency, Montana … home of the Crow Indian Tribe, mortal enemies of the Lakota interlopers to their homeland. That is how 6 of them came to be scouts for the 7th U.S. Cavalry, led by General [brevet] George Armstrong Custer, back in 1876. This little campground was just to the east – maybe a little north – of the famous Last Stand Hill where Custer and about 50 of his men were found mutilated … and very dead. But, at that moment, it could have been in my back yard. All was dark & silent, except, for the sound of coffee beginning to percolate. I just sat in silence, absorbing the smell of those brewing coffee grinds. Poured myself a mug full of the awakening beverage, and then, that zippering sound again. Out rolled my oldest boy, Jesse — then 6 years old. This was 1987. We quietly chatted. Then, the sky began to brighten, ever so slowly. It is very likely that my two other urchins, Adam & Christopher, popped out of the tent about this time. The day before, we had driven and hiked around the battlefield which stretches some 3 miles along the Little Bighorn River. One of the things that struck me, as we were on foot among the markers – [they are not headstones, though there is a National Cemetery in the Park, but rather markers that denote where bodies, in some cases specific bodies, where found by the burial parties] – was that you could almost feel the flow of the battle. Those markers make this the most unique National Battlefield in the Park system. 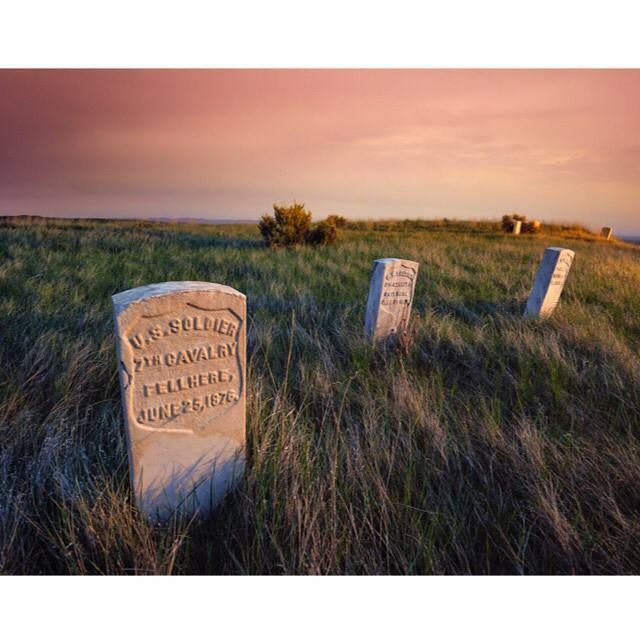 Little Bighorn – or, Custer’s Last Stand – is a pristine & peaceful place. Yet, for two days in June it was dusty, loud, violent, and bloody. The dichotomy cannot be ignored. The morning sun began to rise. We had a clear view from our campsite up to Last Stand Hill and Battle Ridge beyond. The markers glistened. There was a beautiful orange glow cast upon the site. It was quiet, we had our comforting coffee, it was a glorious sunrise. And we were gazing upon an iconic location where a scene of lifelong interest had taken place. Now, in my reflective mind, it was coming to life. It was a recipe for our own private nirvana. To this day, those moments were among the most calming I have ever known. Wish I could bottle it: some quiet solitude, a cup of coffee, a dash of children, sprinkle in some sunrise, and a scenic and/or historical site to jump start the imagination. Perfect, to my taste! Previous Post: Gatherings for the Ages!